Following the defeat of his lieutenant Crixus, Spartacus continued north for the Alps, passing through Picenum. Two Roman armies moved against him. From the south, the consul Lucius Gellius Publicola pursued with his army, fresh from his victory at Mount Garganus. To the north, his fellow consul Gnaeus Cornelius Lentulus Clodianus moved to block Spartacus’ path. The Roman plan was initially successful. Spartacus was cornered, and the two Roman armies advanced to within sight of each other. Unfortunately, the Roman commanders, disdainful of Spartacus’ abilities, became too clever for their own good. They left an inviting gap between the two Roman armies, as if in error, to invite Spartacus to attack between both armies. Spartacus had other ideas. 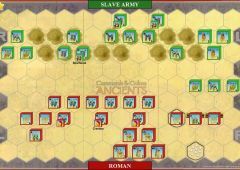 He split his army, leaving a small force to keep Lentulus busy, while he led the main attack against Gellius. Outnumbered, this Roman army was defeated. 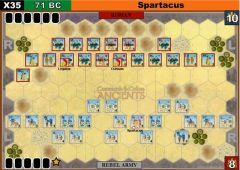 Spartacus then turned his troops against Lentulus. The second army was also smashed. 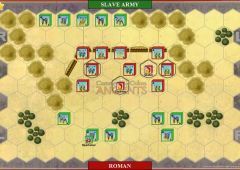 The Roman leaders escaped capture, but large numbers of prisoners and much equipment fell into the hands of the slave army. Spartacus sacrificed 300 Roman captives to avenge Crixus, and then resumed his march to the Alps and freedom. 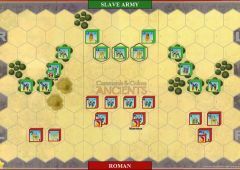 • For the Roman player, any Command card that is played may only activate units in one army—Lentulus’ or Gellus’. The elements of a Command card cannot be shared, and units cannot change armies. 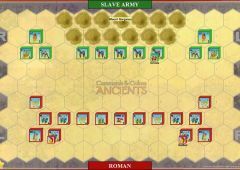 To help keep track of separate armies, we recommend that one Roman army play with its blocks laying flat and the other play with its blocks standing. Initial positioning on the battlefield: all Roman units to the left of the hills are part of Lentulus’ army. All Roman units to the right of the hills are part of Gellus’ army. 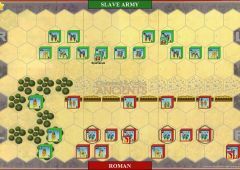 • A Slave unit that exits off the Roman side of the battlefield counts as one Victory Banner for the Slave player. • Rolling Fire rules are in effect. Slaves won 8:5. 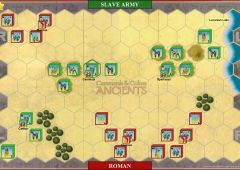 Romans did okay on right, but slaves rolled Roman right, and Spartacus started to roll the right side of Roman left army. Played again, 14 turns, Slaves 8:3. 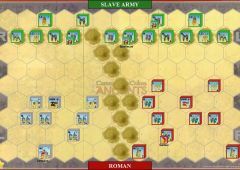 The Romans were really hindered by their divided command more than anything else, weakening their hand's effectiveness. 10 turn solo game, Romans 8:4. No shattering moves, just steady work, Marian unit fire, heavy fire couple of times to take a block out of warrior unit early etc.